Classic leather shoulder bag in hunting style, made from dark brown cowhide, approx. 3mm thick, and with a nubuk finish. This leather bag features 3 pockets: a 5cm main compartment, a 2cm deep zipped pocket and a 3cm rear compartment. The leather tongue closure can be pulled through the loop and additionally secured by means of a press-stud. The shoulder strap is approx. 2,5cm wide and approx. 120cm long. 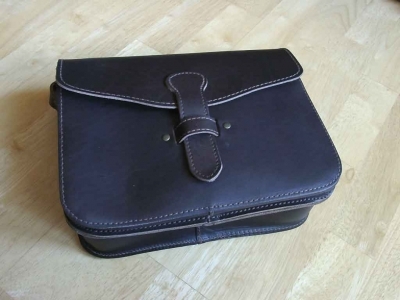 This shoulder bag is hand-made in Germany. The leather bag is approx. 28 cm wide, 21 cm high und 10 cm deep.